If you haven’t chowed down on a keto-friendly pie or pizza or any number of traditionally carb-y favorites, what are you waiting for? While these foods are still treats and not everyday indulgences, there are lots of creative ways to enjoy them when you’re trying to cut carbs, whether you like to bake at home (hello, fathead dough) or prefer to grab some bread at the store. 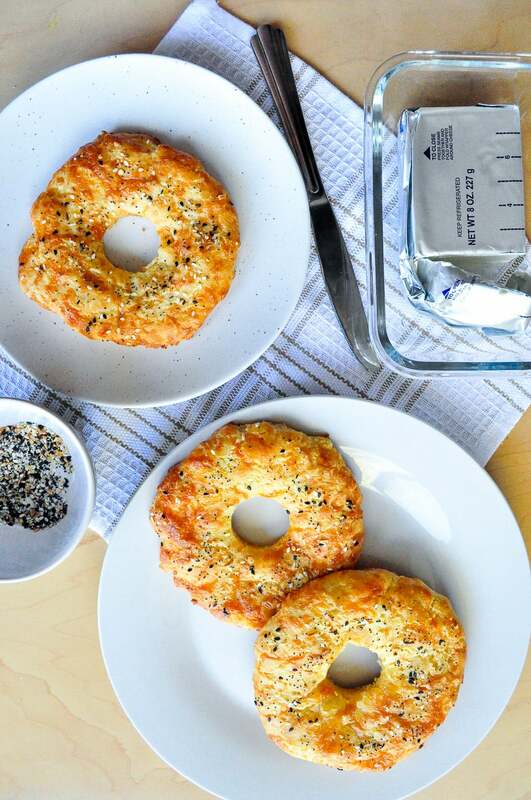 Personally, I love, love this cheesy bagel, which in my unbiased opinion (ahem), tastes just as good as the real thing and possibly even better. If the delicious flavor wasn’t enough, the recipe also requires very few ingredients – just seven total, including seasoning – and is ready in 25 minutes. 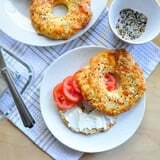 Yes, just 25 minutes, and brunch is served in a toasty, savory bagel. I’m willing to bet your brunch crew wouldn’t even know it’s low-carb. Place shredded cheese and cream cheese in a large bowl. Microwave on high for 30 seconds. Remove from microwave. Into the same bowl, add the almond flour, one egg, baking powder, and a pinch of salt. 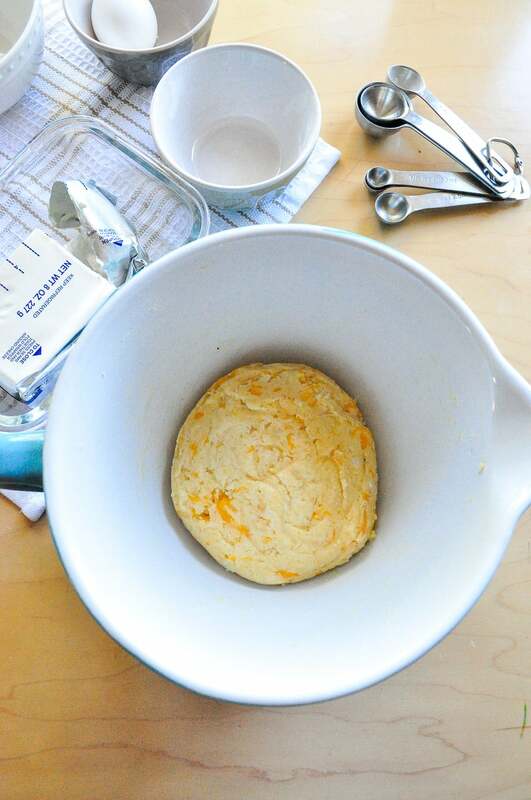 Combine using a rubber spatula just until the dough sticks together in a large ball. Separate the dough into three small balls. Roll them and then flatten with your hands. Make sure you don’t flatten them too much, though, as they’ll spread a little in the oven. Punch a hole out of the center of each ball of dough. Whisk the other egg in a small bowl. 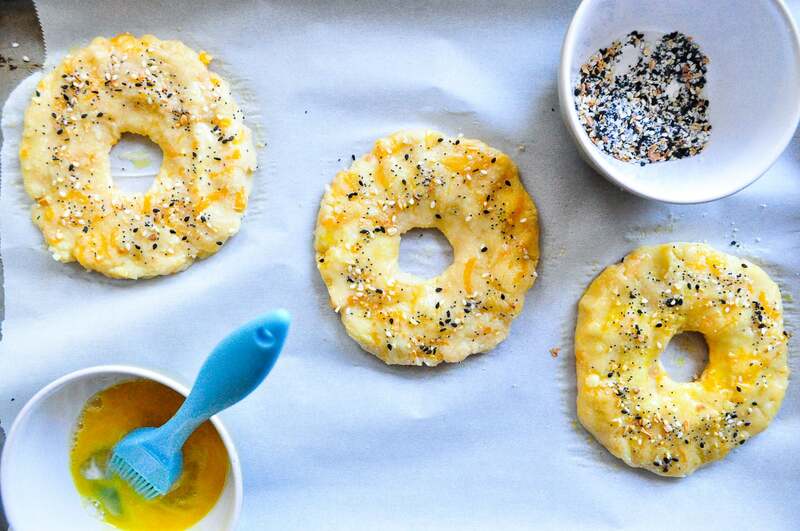 Using a pastry brush, coat the bagels in egg wash.
Sprinkle with seasoning and pop them in the oven for 13 minutes. Once they’re finished baking, allow the bagels to cool for 5 minutes. Slice open and serve with all your favorite fixings.